CitiBike has landed. Yesterday, amid a scrum of politicians and reporters, city officials introduced the system poised to transform New York street life. But keeping track of 6,000 new bikes—not to mention their riders—will be no small chore. And to do it, the city is implementing a handful of smart systems, ranging from modular docking system to self-powered tail lights. The program is a long time coming. Other cities, like Boston, D.C., and Chattanooga (who knew? ), have been there first. But New York poses its own unique problems: There’s the simmering culture war between cyclists and pretty much everyone else. There’s the vastly understaffed accident investigation squad, which proved ill-equipped to handle the cases of several cyclists killed over the past year. There’s the infrastructural shortcomings of a densely-populated city where roads are vital economic lifelines—and where the use of those roads by cyclists is often viewed as nothing short of aggressive. CitiBike, then, represents a massive experiment. It will put thousands of new cyclists on the road. It will introduce New York to cycling as a mode of transportation, rather than the rarefied subculture of Freds, Joseph Gordon-Levitt, and David Byrne. For drivers and longtime cyclists alike, this is a watershed moment, fraught with anxiety. At the same time, for all of the hand-wringing and political backtracking it's incurred, CitiBike represents the culmination of some pretty interesting technologies. 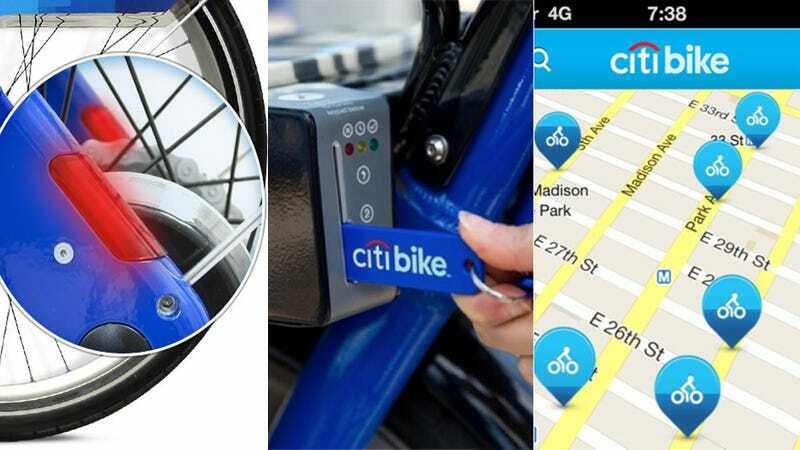 CitiBike is being funded by a $41 million sponsorship from—you guessed it—Citibank. But the system itself was designed and built by Public Bike System Company (PBSC, also known as Bixi), a privately-held nonprofit that was formed by the city of Montreal after the successful installation of their bike share system, in 2009. Since then, Bixi has installed similar systems in a host of other cities. Bixi has surprising origins. The system was created by Charles Khairallah, a Canadian robotics engineer, who designed the docking system from scratch. Khairallah is well-known for his ideas about modular robotics—using a simple series of robotic components, his company has designed complex systems for everything from aerospace engineering to HVAC cleaning. "To build traditional robots you might need 100 different kinds of parts," he said in an interview last year. "With ours, you might need many of only one type of part. This technology is a genetic family of products. We can create different products from mass-produced, identical modules which are scalable for larger or smaller robots." That ethos—of durable, simple components that interlock to create a responsive system—is the basis for the CitiBike dock. Each dock is made up of a simple set of parts, which can be assembled in minutes and moved at the drop of the hat. The system is completely wireless and self-sufficient, and its few moving parts are designed to be easily replaced. A photovoltaic array sprouting from the RFID-based payment tower supplies all the power needed to send signals back to the system hub, which keeps track of when a bike is checked out and returned. The bikes themselves—45-pound tanks, with nitrogen-filled tires, three-speed gears, and self-powered LED lights—are simple by comparison. The real intelligence of Khairallah’s system is embedded in the docks themselves. Last year, a Department of Transportation study revealed that most pedestrians, including locals, are basically wandering through the city in a state of perpetual confusion. Well, not quite. But nearly 30% of visitors, plus 10% of locals, admitted to having been lost within a week of being questioned. In fact, many of those interviewed couldn’t say which direction was north. It’s actually shocking those numbers aren’t larger, considering the meager signage options available to lost pedestrians (ask a street vendor? Go back down into the subway to peer at the map? Find some moss?). On the heels of that study—and in anticipation of CitiBike—the DoT tapped their longtime collaborators, the graphic design firm Pentagram, to create a $6 million comprehensive wayfinding system for pedestrians. The new signs rolled out in March, and they’re an essential part of the CitiBike docking system. Based loosely on Massimo Vignelli’s classic signage for the MTA, the signs orient cyclists and pedestrians with easy, obvious cues. For example, a transparent overlay of landmark buildings. Or a dotted circle that shows scale in terms of walking time. It’s not the most glamorous part of the bike share system, but it might be one of the most important. The only bigger liability than a lost, distracted pedestrian is a lost, distracted cyclist. Every CitiBike docking station has a limited number of parking spaces. And because there’s a strict time cap on each rental, giving cyclists a guaranteed place to return their bikes is an important part of the system. That’s where the CitiBike app comes in. Developed by Publicis Kaplan Thaler, the Manhattan mega-agency, the app sits atop the Google Maps API, showing nearby stations as pin icons. The shading of each pin represents the fullness of each dock—that way, you can skim the map and know, immediately, where you’ll be able to dock your rental. You’re also able to favorite stations, route maps, and check in on your membership. Eventually, according to the CitiBike website, the data culled from the app will be shared with the public. That may be a few months down the line—for now, the CitiBike team is sharing basic user information on their blog. How are things shaping up? After only a single day of operation, there are already 16,463 annual members. A major goal of the Bloomberg administration has been to make the city “smarter,” through initiatives like a design competition to retrofit pay phones, the naming of a Chief Digital Officer, or the annual BigApps competition. CitiBike, though it hasn’t really been couched as such, is the first full-scale implementation of these ideas. Beneath all of the teeth-gnashing and turmoil lies a glimpse at the future of our city's smart urban infrastructure.